As a child, my love for history drove me to read everything I could get my hands on about colonial and American history. Later in life that interest led me to the 18th and early 19th century events called rendezvous and re-enacting and my introduction to the art I now produce. 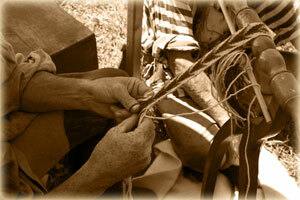 Finger weaving, to me, is more than just history; it is an art. I am an artist by my own hand. When I became interested in finger weaving, I had never seen a piece of work. Had never laid eyes on a bag, sash, or tumpline. I taught myself this art with the aid of two publications. From these and many questions and endless hours of research, the products I now produce were born. Fingerweaving seems to have no definite beginning. It's origins are lost in time but it has existed for thousands of years. Fingerwoven pieces were used to make impressions on clay pottery. The piece would be pressed into wet clay, which left the design. The design was then permenantly engraved in the fired piece. These weavings were often done by a method called "twining". The work more commonly thought of as fingerweaving, the items I make in wool yarns, are representative of the items that begin to appear in collections around the middle of the 1700's. Although beautiful in their design, these items were not just for show. My art was used to produce functional items for daily work. Sashes, bags, garters, straps for bags and powderhorns, tumplines (burden straps for carrying and dragging loads), garters and other items were useful tools. Some pieces were dyed using a technique called "resist" dying. By asking people who specialize in natural dying I was able, over a period of several years of experimentation, to reproduce what I believe to be the methods used in dying items made in the 18th century. Resist dying is the art of dying material and using something to block the dye from penetrating certain predetermined areas of the material being dyed. This creates an un-dyed place on the piece, forming designs of contrasting color. On other pieces these lighter, or different colored areas seem to have been achieved by "reducing" or "bleaching" the main color. I take great pride in my work. Not because I am self-taught, but because I am reproducing a piece of history from a time in our nation that intrigues me. I take enormous joy in discussing my work and its era with the public.